We may hate to admit it (and never would to the French), but the truth is that there is still nowhere in the world where food and cooking are so passionately and intricately woven into lives, hearts and minds than in France, a country where masterpieces of home cooking are produced nightly, whether for a family supper or chic dinner party. So how does that archetypal Frenchwoman do it? And how can we take a feuille out of her livre? This book tells you exactly how. With chapter titles such as ‘Shops Wisely’, ‘Knows her classics’, ‘Steals from chefs’ and ‘Rises to the Occasion’, this book will both delight and inform. Trish will teach you all you need to master French cuisine, from the classic dinner party recipes to the latest trends as well as how to tackle difficult ingredients such as truffles and lobster. 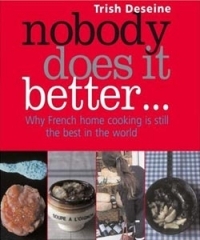 An affectionate yet unsentimental, irreverent but non-patronising guide from one of France’s top cookbook authors, “Nobody Does It Better” is set to steal a place on your kitchen shelf. It is the most engrossingly enjoyable, alluring, fantasy-fuelling - and funny - book about how to shop, cook, eat and live like a French woman.